Amongst the most recommended computing device to build these kiosks is industrial panel PCs with projected capacitive touchscreen features. Industrial PCs with 22-inch touchscreen display feature can accurately detect multiple touchpoints such as tapping or pinching gestures. So, it is responsive to user input regardless of frequent usage, making it an ideal device for interactive kiosks. Aside from its better touch capabilities, this panel device has other key features that can be utilised in advanced kiosks. So, let us explore more about the advantages of using the rugged S22 touchscreen PCs for interactive kiosks. Of course, advanced kiosks are not installed to replace store personnel. However, this person might be attending other clients’ needs, especially during peak hours. So, by integrating kiosks with a built-in 22-inch touchscreen panel PC will allow the customers to browse the desired product’s information. This device comes with an Intel® GMA HD4 000 DX11™ GFX core (DVMT 5.0) graphics card. This allows the device to display high-quality videos and images on the screen. So, this makes it an excellent marketing tool when showcasing products to potential customers. Now, how can this device offer long-term availability to ensure that it can be optimised in advance kiosk?. Find out more why it makes a great computing technology for these kiosks. Apart from its dynamic and sleek design, kiosks are built for public use. This means that many people with different behaviours often utilise it. Therefore, a reliable kiosk must have the capabilities to withstand extreme working conditions. Here are key features of 22” industrial panel PCs. Interactive store kiosks should remain operational despite the changing temperature. That is why the S22 touchscreen computer is ideal for this application since it is built with components which can operate at various temperatures. It has an external fan and internal heater which can increase the operational temperature gradient from –30oC to above 50oC. So, the kiosk can function well regardless of the environmental temperature. Scratch marks due to consistent use may become apparent on commercial grade touchscreen PC. However, the S22 panel PC has a projected capacitive screen interface. This screen is built with a protective tempered glass layer with a 5H hardness rating [Control Design (PDF)]. This will prevent scratches due to consistent usage from occurring. This panel device also has a sunlight readable projected capacitive screen with a 91% transparency and a 1920 x 1080 resolution. This will allow customers to view highly detailed images on the kiosk display regardless of the sunlight. As a kiosk manufacturer, it would be ideal to offer physical gizmos that provide better functionality to retail businesses. 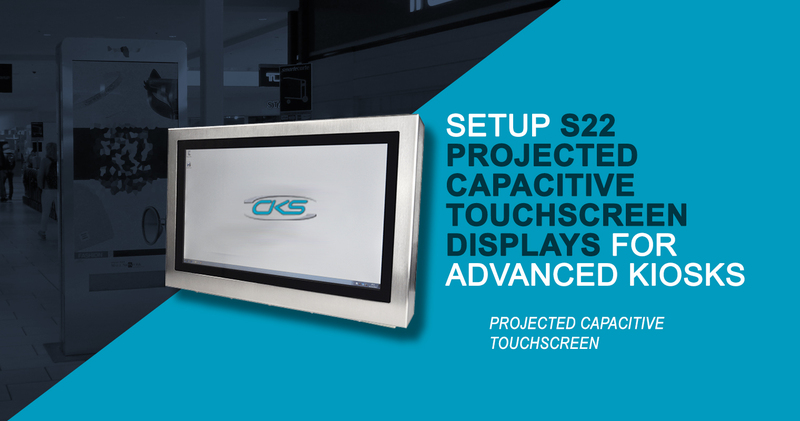 Advancing to kiosks with S12 capacitive touchscreen displays provide customers with an interactive device, which can be used to find information related to the store product. Its responsive interface and bright screen display highly detailed and appealing images, which help improve the overall customer experience. So, contact a reliable industrial computer manufacturer and start building 22-inch projected capacitive touchscreen PC for the store kiosk today.